In any art gallery in the world, you will see visitors standing as close as possible (without alarming the security guard) to the works of art – leaning in to try and see every brush stroke, dollop of light or shadow. We are fascinated by the details and how they reflect the artist’s intention and technique. Today’s art lovers can see more than any previous generation; macro photography can zoom right in on the canvas. For example, I recently imaged this landscape painting by Canadian artist, Dylan Swan. The world of art benefits from macro photography in more ways than enhancing the public’s viewing pleasure. (Make no mistake, though, there is a lot at stake for art galleries and museums to differentiate themselves and draw more visitors.) Art conservation and analysis, and keeping a digital record of a valuable art collection, are other compelling reasons to turn to macro imaging. Photography is an important tool for the art conservator; however, the resolution of current digital photographic technologies limit the application of this approach. New developments in hardware and software allow for the creation of very high resolution digital records of works of art that provide more data to inform analysis and restoration work. Recently I was a guest lecturer at Queen’s University Department of Art History & Art Conservation. I was presenting on how our Magnify2 imaging system works, and how the extremely high resolution images can be used in the art world. While touring the art restoration labs Norman Paul, Adjunct Professor, Imaging & Documentation, pointed out several pieces at various stages of restoration and explained the importance of accurate digital records of the starting condition, each step of the process and the final result; this documentation then becomes a part of the provenance of the artwork. Longer useful life of images – Many galleries restart their digitization efforts every 5 years or so because of advances in technology. 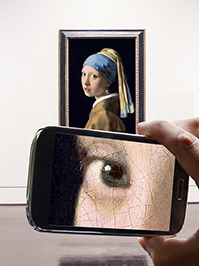 With the Magnify2 system, artworks are imaged in the gigapixel range so they won’t be out of date in just a few years. Efficient use of resources – 90% of the imaging process is automated, including capture and post processing, so your staff can be doing other things while the system works. In fact the system is designed to operate lights out so your capture time is virtually 24 hours a day, not just the 8 hours a day that your staff are onsite. We love working with art galleries and museums who understand, like us, that the genius is in the details!